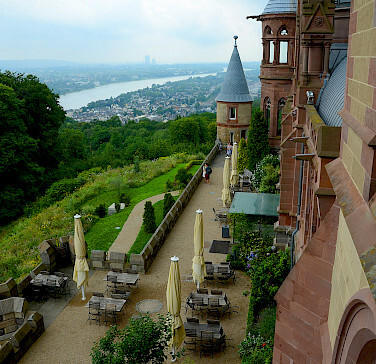 This is an active vacation by bike and boat in Germany along the banks of the Rhine and Main River. Your adventure begins in Cologne, Germany's oldest city, overseen by the towering Cologne Gothic Cathedral and ends in Bamberg, whose entire Alstadt (old town) is a Unesco World Heritage Site. 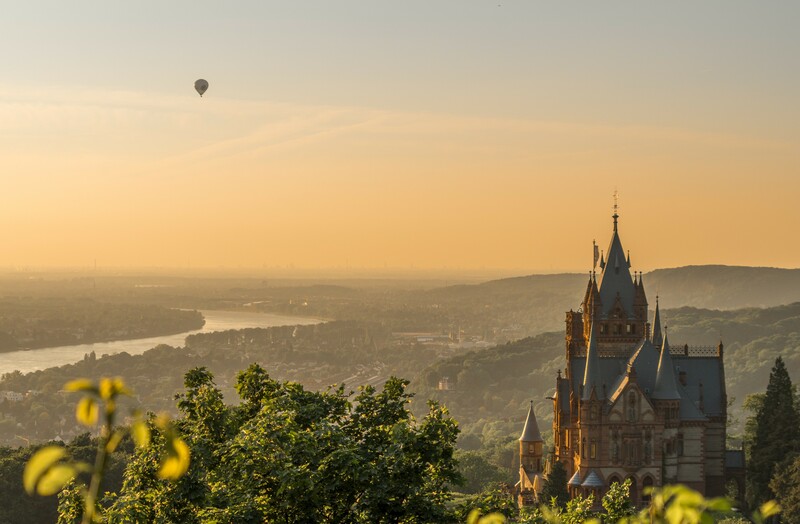 You will spend time in fabled cities and villages such as Koblenz, Frankfurt, and Würzburg, meander medieval alleyways and cobblestone streets surrounded by antiquity, yet infused with a youthful and energetic spirit. History flows as deep and powerful as the rivers' currents. Cycling alongside these rivers on the well developed network of bike paths, provides for a unique perspective of the country and the people. You pedal a relaxed, scenic and traffic free route from one historic town to the next through a dramatic and varied landscape of cliffs, creeping vineyards, forests, orchards, lovely meadows, and medieval hill top castles. 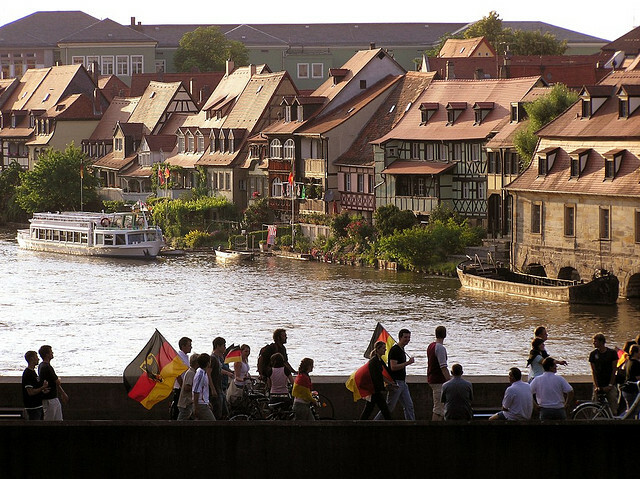 We have many other bike and boat tours in Germany. Be sure to check them out! We suggest flying into and out of Frankfurt International Airport (FRA). 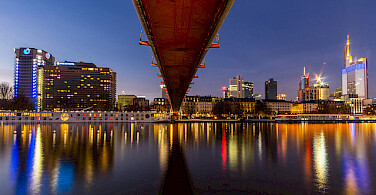 From the regional train station, located on the lower level of the Frankfurt International Airport, you can access an Intercity Train (IC) to Cologne. Train travel time varies according to type of train. 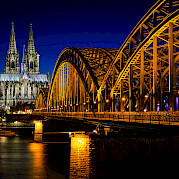 Direct Intercity Express trains can travel to Cologne in approximately one hour. Return to Frankfurt Airport from Bamberg is approximately a three hour train ride. Individual arrival in Cologne. Boarding begins at 10 am. At 12 pm, you will have a welcome meeting and introduction to the crew, the vessel, and the program to follow. 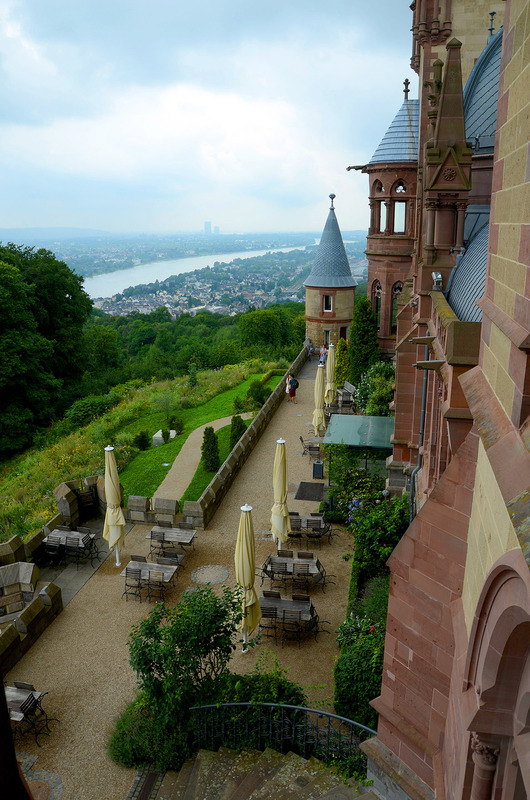 During lunch, the Quo Vadis will motor to Königswinter, home to the fantastical castle, Schloss Drachenburg. Once moored, there will be opportunity for a short bike ride to become accustomed to the bicycles. The day begins with a breakfast cruise to Remagen, famous for the Ludendorff Bridge, whose remnants remain today on the west bank of the Rhine. Despite the Nazi's attempt to destroy the bridge during WWII, it was captured intact by 9th Armored Division soldiers on March 7, 1945, enabling thousands of American troops to pour over to the eastern side of the Rhine in Operation Lumberjack. There will be opportunity to visit the Peace Museum, located in the bridgehead, dedicated to the history of the bridge and the event. 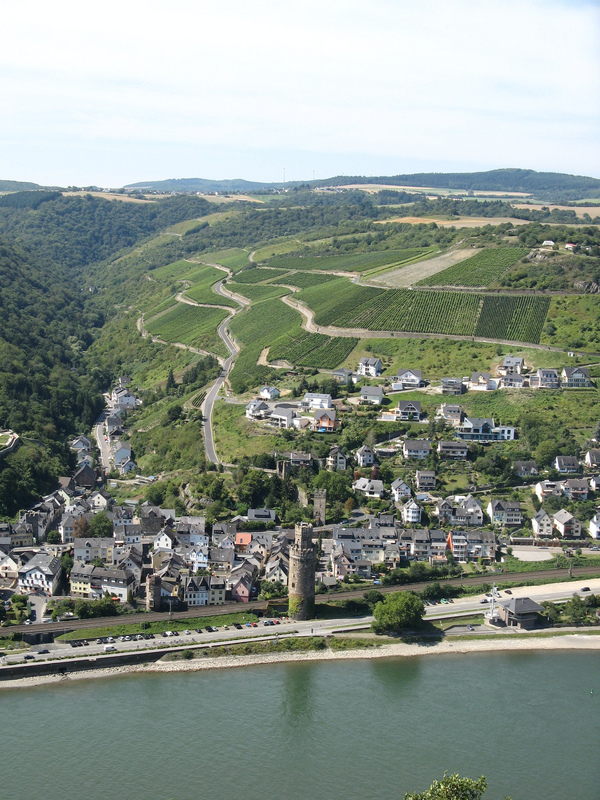 The cycling itinerary begins here in this historical village through a more romantic, medieval section of the Rhine valley with castles and fortresses clinging to the hilltops and vineyards creeping up the slopes. The route leads through the spa resorts of Bad Breisig and also Bad Rhineeck. 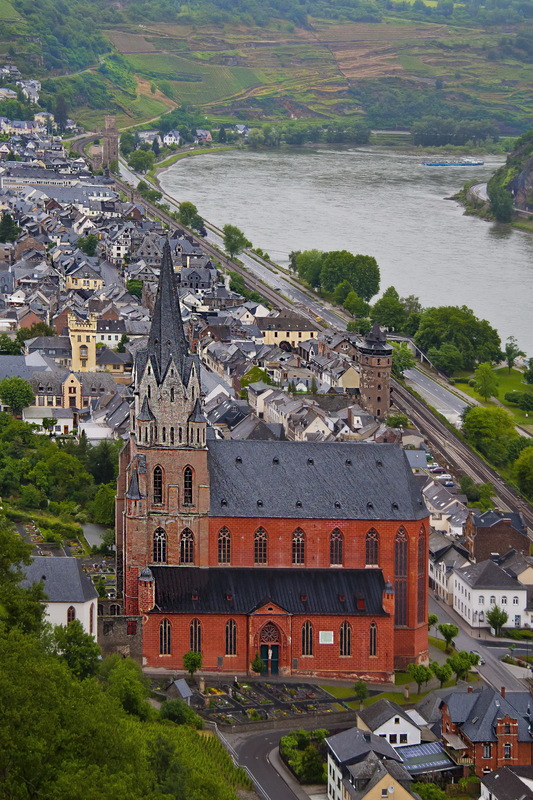 The itinerary includes a stop in Andernach, once a Roman settlement and then, arrival in Koblenz, where the Rhine & the Mosel Rivers meet. 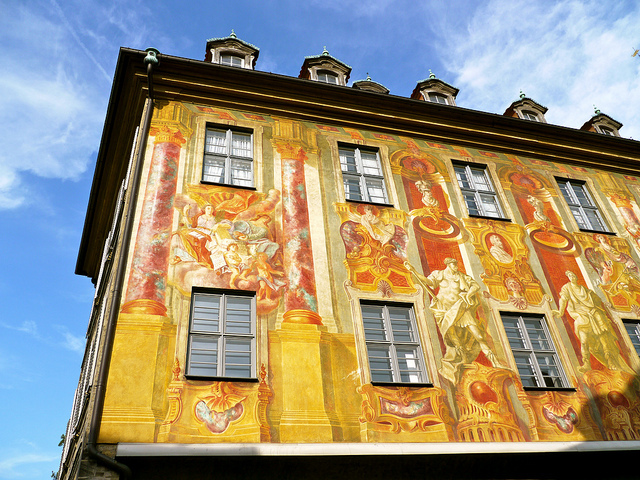 The city itself constists of the Alstadt (old city) and the Neustadt (new city). 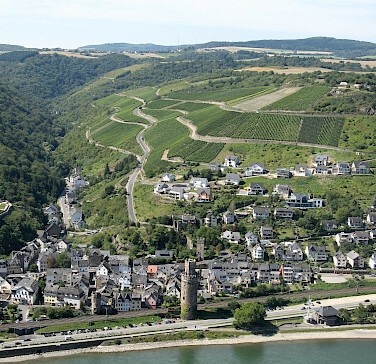 The Alstadt is the shape of a triangle, with 2 sides consisting of the Rhine & Mosel rivers, and the third side is covered by endless hills topped with fortresses. The barge sets off early this day. The highlight of the morning is to sail along the Loreley, the magnificent rock on the right bank of the Rhine River. 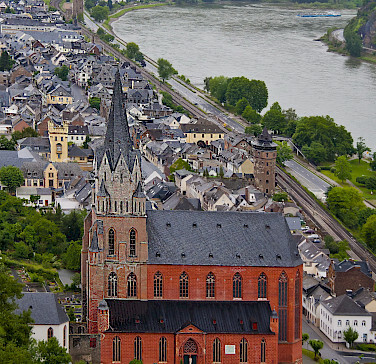 The cycling begins in Oberwesel and leads along the Rhine river, passing charming villages such as Bacharach and Rüdesheim, known for its famous shopping street the Drosselgasse. Bingen is opposite of Rüdesheim on the left bank of the Rhine. Biking further along the Rhine river towards Mainz, the capital of Rhine-Palatinate. Smooth and perfectly flat bike lanes, apart from any distracting traffic, allowing you to ride in peace, In Mainz, you can stroll the old city of Mainz, through the Old Town and inner city. Big, broad plazas, lovingly restored half-timbered houses and magnificent Baroque churches give the Old Town its charming character. 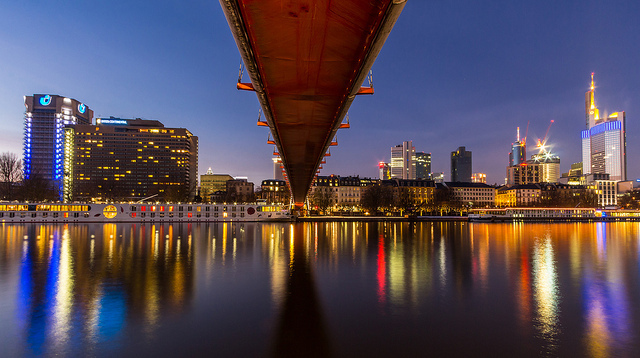 In the afternoon, you board the Quo Vadis, and head to Frankfurt, a thriving metropolis with modern buildings, museums, and a lively shopping center. 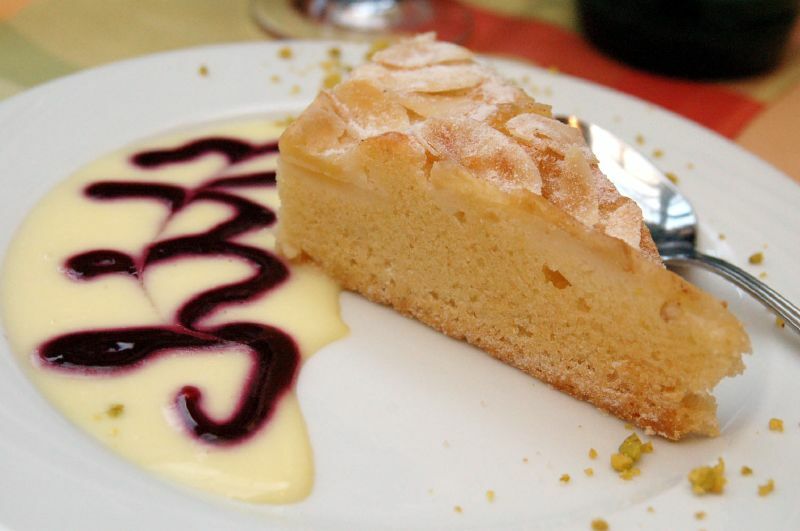 During breakfast, the Quo Vadis motors to Offenbach where the bike tour will begin. The cycling will lead to Bürgel, Mühlheim and then to Hanau, the town where the famous Grimm brothers were born. 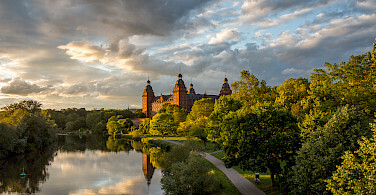 Via Steinheim, with its charming historic center, Kleinauheim, Hainstadt and Klein-Krotzenheim, always along the Main River, and finally to the small and romantic city Seligenstadt with its meandering alleys, half-timber houses and the basilica. 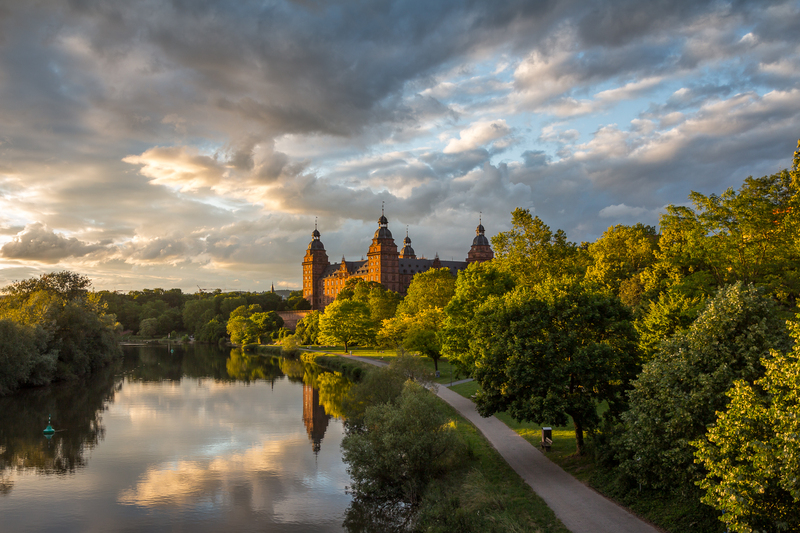 After crossing the river on a small ferry, the cycling continues to Dettingen and Kleinostheim, to the day's destination, Aschaffenburg, with its museums, churches and of course the famous castle! Following the river (sometimes on the right bank and then again, on the left bank) the cycling leads through lovely small towns and villages, such as Obernberg, and further on, Klingenberg and Groszheubach, both famous for their fine red wines. The day ends in Miltenberg. This is a charming village because of its meandering streets and alleys, old restored half-timber houses and the historic market square, Alter Markt, located in the most beautiful part of Miltenberg, a wide open space, with a slight slope to the hillside. 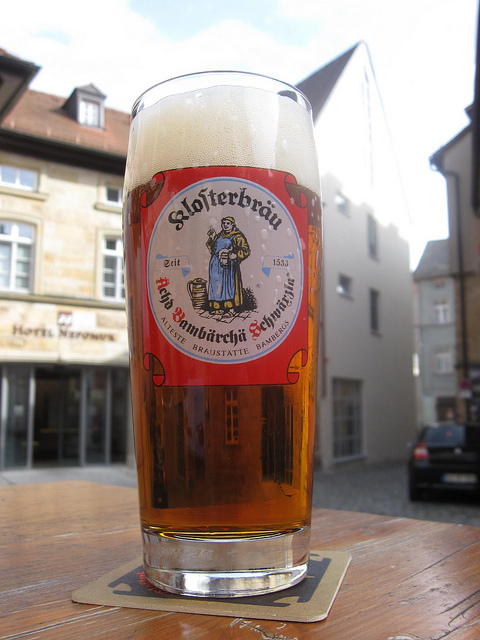 Be sure to go for a refreshment in the oldest pub of Germany, Gasthaus Zum Riesen. 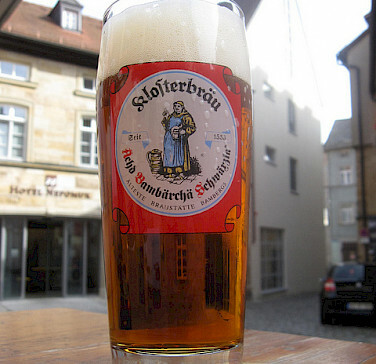 In the evening, there will be time to enjoy a bit of beer tasting. While you enjoy a sailing breakfast, the Quo Vadis motors from Miltenberg to Wertheim at the confluence of the Main and Tauber Rivers. 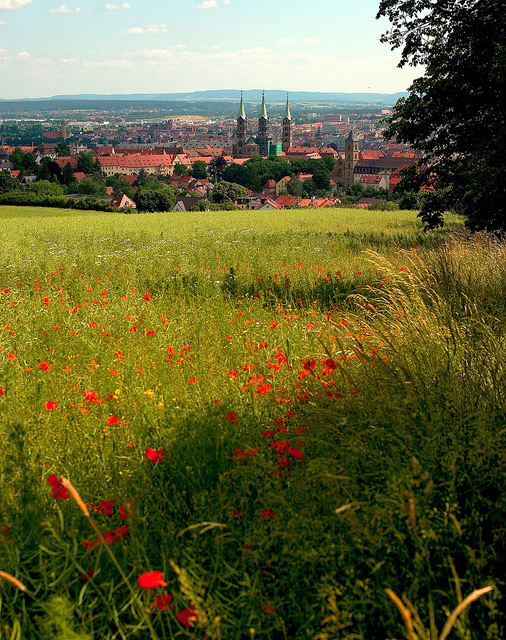 Known for its glassworks, Franconian wine, and friendly people, it also possesses an historic center and mountain ruins. The route continues to Gemünden, passing the half-timber castle Homburg, through a varying landscape of climbing vineyards and forested mountain slopes, dotted with historic monuments, like the Triefenstein monastery. The day ends in Gemünden am Main, at the confluence of three rivers: Sinn, Saale and Main. Today the bike tour will lead you further along the Main River, passing Karlstadt with its historic center, Zellingen, and Erlabrunn. 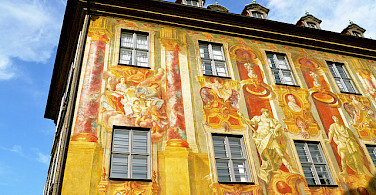 Afterwards you will reach Würzburg, the Baroque town on the Main River. Be sure to explore this beautiful city, hike the road that mounts gradually as you will go on and climb the fortress that offers a magnificent view on the historic center of Würzburg with its many towers. 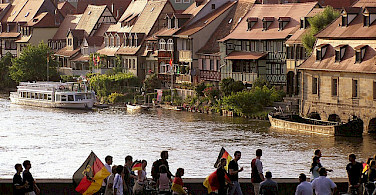 After your visit of Würzburg you will embark the Quo Vadis and sail to the charming village of Marktbreit. During the cruise, enjoy the views of passing vineyards and hills full of vines and charming wine villages like Sommerhausen, Eibelstadt and Ochsenfurt. The boating begins in the morning, passing Kitzingen, famous for its leaning tower of which the story goes that’s its leaning because the builders, who - because of water shortage - mixing the mortar with wine instead of water, tasted a bit too much of the wine themselves. The day's bike tour will start at Wipfeld, close to Schwarzach, passing villages that are all very well known to wine connoisseurs like Sommerach, Nordheim and Volkach. Here you will admire a cultural highlight: the pilgrimage church ‘Maria im Weingarten’ and the famous ‘Madonna im Rosenkranz’ by Tilmann Riemenschneider. The boat will dock in the city of Schweinfurt, with its old town full of cosy little spots, the town hall, the tower, market place, museums and galleries and amongst them all the artificial ‘Schweine’ (pigs). The day begins with a sailing breakfast, after which, disembarkation will be in Hassfurt, famous for the late gothic Ritter chapel and the late gothic church at the market square with its valuable paintings (John the Baptist and Maria with child) by Tilmann Riemenschneider. From here we bike to the town of Eltmann and further on the Main river, passing the famous pilgrimage church Maria Limbach. 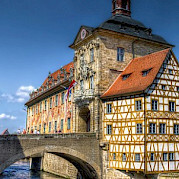 We reach Bamberg, a very charming, historic bishops town with Villa Concordia, the historic lock 100, the water castle, the baroque house on the bridge and the former fishing settling Small Venice all emphasizing the tight connection between town and river. The program officially ends after breakfast. 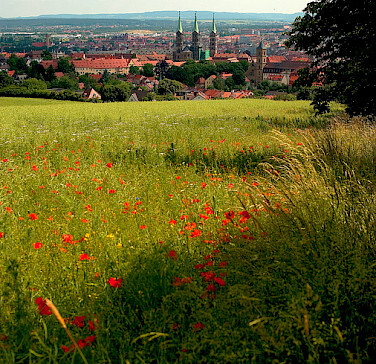 Perhaps you will choose to extend your stay Bamberg! If you’re looking for a different flavor, check out our full list of bike and boat tours or view all our featured bike trips, specials, and news. Overall, the trip was good. There was, however, a disconnect among what our trip itinerary described and what the guide and the captain thought in terms of mileages and what entrance fees were included. 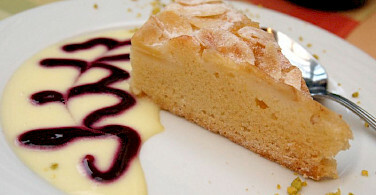 The guide used the corner system. That means that the entire group has to ride together and do the same mileages each day. The trip description notes that each participant will receive maps and be able to ride on their own. We did not receive maps and therefore it made it impossible to ride on our own.